On An Overgrown Path: What price a new concert hall? What price a new concert hall? 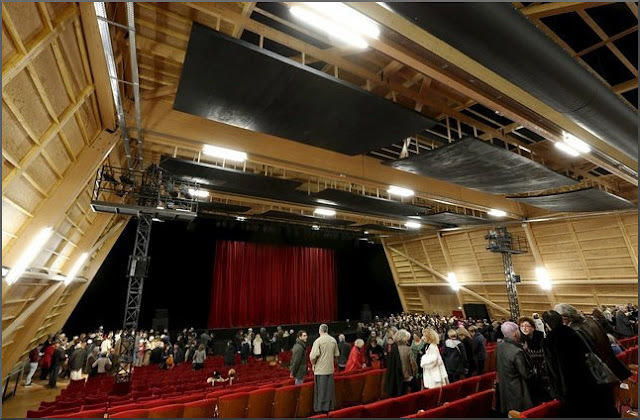 When faced with a three year closure of the city's city's almost 200 year old opera house for a much-needed renovation, the city of Avignon in France came up with a truly innovative solution to keep classical music alive for the city's residents. 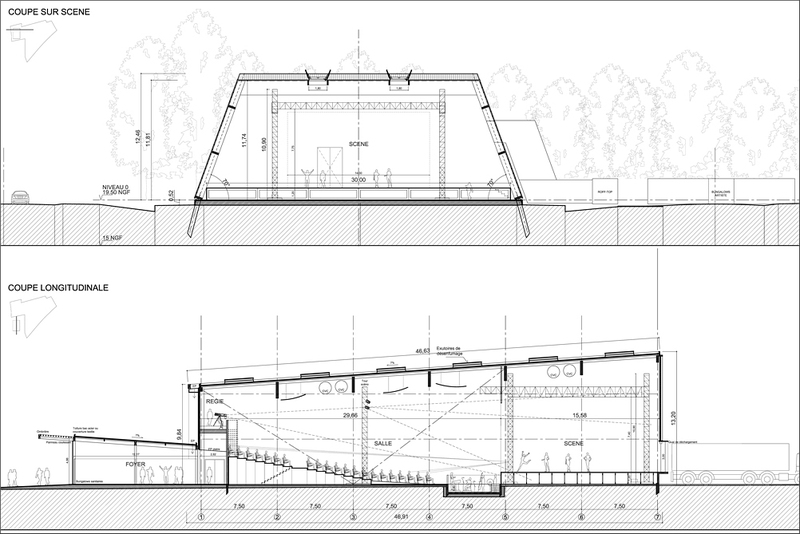 A temporary opera house/concert hall has been built on vacant ground on the city's outskirts close to the TGV - high speed train - station that links Avignon to Paris and the rest of France. This development area is where the mighty Rhône and Durance rivers meet, so the temporary auditorium is known as Opéra Confluence. The DE-SO architectural practice led by partner Sandrine Charvet has created a temporary auditorium and public spaces using the wooden interior and framework seen in the header photo. This frame is made from gulam bonded timber, with insulation sandwiched under exterior cladding, as can be seen in the external view below. Below are elevations of the new hall. Recycling was a major part of the brief: some of the 950 seats came from an opera house in Venice, while the remainder and stage structure came from the renovated Liège opera house. 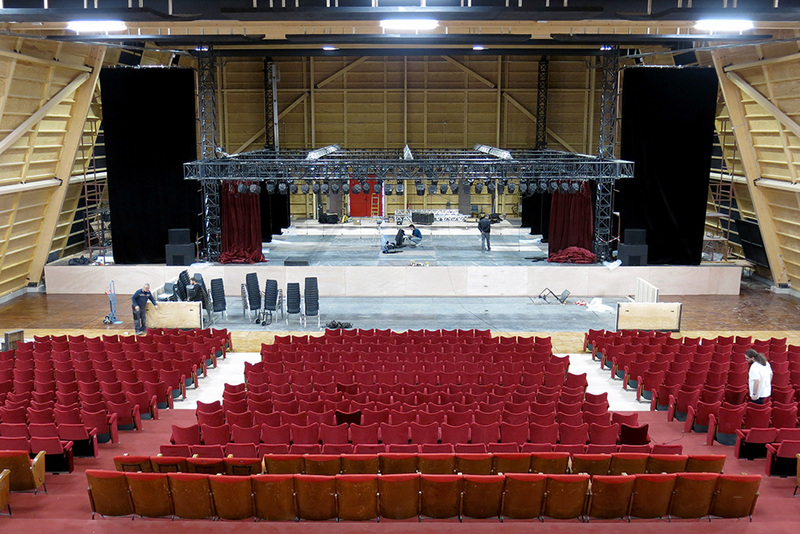 The wooden auditorium is specifically designed to be easily dismantled and used at another site in the future. 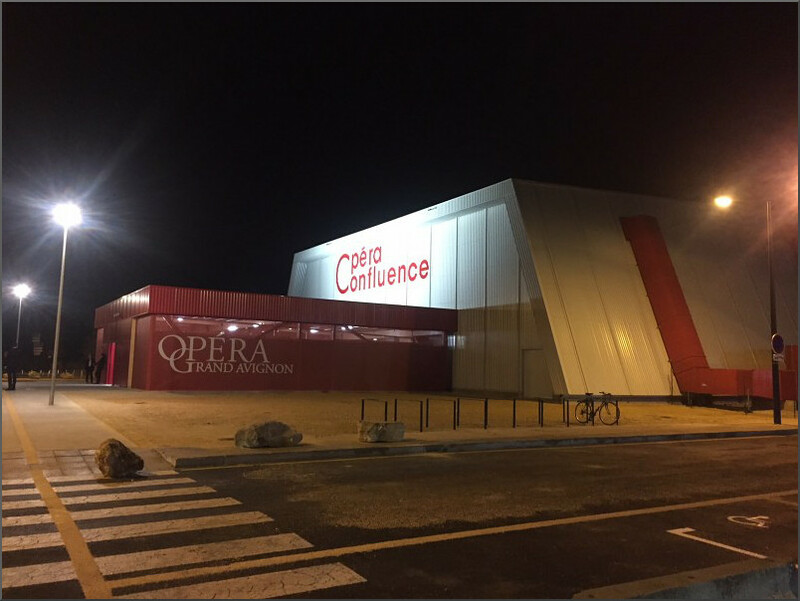 The Opéra Confluence opened at the end of November and a few days ago I attended impressive performances there by L'Orchestre et Choeur régional Avignon-Provence conducted by Samuel Jean. Quite appropriately in these Brexit-dominated times the programme was Beethoven's Ninth Symphony prefaced by René Koering's expanded orchestration of Debussy's Pelléas et Mélisande suite. The sound was surprisingly good, aided by the reflective wood interior and acoustic tuning panels, although the relatively small auditorium inevitably made the sound somewhat dry. It is also worth noting that the concert late on a freezing December weekday evening tempted a large audience out of the city centre, despite the programme being repeated at an earlier time on the following Sunday. Purists will tell us, quite correctly, that the Opéra Confluence's acoustics are no match for those of the much-vaunted Elbphilharmonie, and it does not have the designer cool of the €789m German hall. But both projects are in there different ways very relevant to the future of classical music. So it is disappointing but predictable that while the great and good of music journalism have flocked to Hamburg to sing the praises of the Elbphilharmonie, this article is, to my knowledge, the only one about the Opéra Confluence that has appeared outside the French regional press. The budget for the Opéra Confluence was €1.4 million (£1.24m) with another €18.6m (£16.4m) being spent on renovating the 19th century Avignon Opera House. This €20 million spend compares with first estimates of €315m (£278m) for the new London concert hall advocated by Simon Rattle. So this case study of the Opéra Confluence suggests an attractive alternative solution for London. Commission DE-SO architectural practice to build a temporary concert hall for Rattle and the LSO at a cost of £1.24m on the Queen Elizabeth Olympic Park in the development area of East London, and spend a further (£16.4m) gutting the Barbican and remedying its acoustic deficiencies. Which would leave a useful saving of £260m to be ploughed back into music education. Pie in the sky? No, just European Union best practice. Surely Sir Simon and the rest of the anti-Brexit faction would approve of that? All costs associated with writing this article includng concert tickets were paid for by the author. Our sincere thanks go to the anonymous angel from Avignon University who solved our unforeseen transport difficulties thereby making this article possible. Photo sources: Baz2coM, photo 2 EcomNews, graphic 3 & photo 4 DE-SO Architects. Any copyrighted material is included as "fair use" for critical analysis only, and will be removed at the request of copyright owner(s). Also on Facebook and Twitter.